This article was first published on Talk Magazine Shanghai Jun 2015 edition. earth would anybody buy a property that hasn’t been built yet? With global interest rates at historical lows, many major property markets are on the move. Investors are considering buying properties off the plan, enticed by the hype of a fancy new project in a hot property market at so called “cheap” prices. They hope that by getting in today, and settling on their properties in a few years time, the value of the property will have increased, and they will have turned a relatively small deposit into a substantial profit – all while avoiding those nasty holding costs. Does Buying Off The Plan Make Good Investment Sense? The answer is, it depends. While some investors have made money buying off the plan, there are at least as many horror stories of those who regretted the purchase. Whether you are a happy investor or not is dependent on the location and the specific project you invest in. From listening to friends and clients, the returns have been mixed when buying off the plan properties. I have a client who bought an off the plan property in London over four years ago, and is sitting on a profit of 50 to 60 per cent, whilst at the same time I talked to someone who bought off the plan in Australia, at inflated prices, and is underwater by 20 per cent. Especially in stagnant or falling markets, investors have found the value of their property on completion is considerably less than what they agreed to pay. There are many other factors to consider with buying off the plan, but before I explore them let’s first understand why projects are marketed this way. While developers know they can get a better price for a completed property that buyers can see and touch and feel, today the lenders who are going to fund construction of the project insist a substantial proportion of units be pre-sold to ensure the viability of the project is underwritten. Obviously, the banks expect the developer to make a reasonable profit margin, and so they should. This is built into the final price, as are the substantial marketing budgets, which covers the cost of those full-page ads in the papers, road shows and expensive glossy brochures produced for the project. With most off the plan projects, the broker or developer will provide you with the relevant financials, which ultimately detail the estimated yield you will get on the investment at completion. As the figures are put together by the seller, you should assume the figures represent the best possible outcome. Buying off the plan involves signing an off the plan contract of sale, which is drafted and tailored quite differently to a normal contract. Before signing, you seek legal advice from a contract and property law professional. The contract should include factors in your favour such as a cooling off period, adequate plan disclosure, deposit (not more than 10 per cent), final sale is subject to you obtaining financing, to name a few. Before entering into a contract with a developer, it’s important to perform a background check. Start by visiting the company’s website. You should be able to access information relating to past and present projects, as well as business numbers and contact details. It should also be clear who the directors of the company are. Next, utilise online forums to find out whether other investors have had positive or negative experiences with the same developer in the past. Once satisfied, ask for the license number of the builders used for the construction of the property. You can then do a license check on any of the state government websites, to obtain information. In many jurisdictions it is the developer’s legal responsibility to provide home warranty insurance cover before entering into a contract for the sale of the off the plan property. The insurance covers the owner of the property for loss or damage resulting from non-completion of work, loss of deposit or breach of statutory warranty. A certificate of home warranty insurance should be an original, issued by the insurer. It should feature the property’s address, name of homeowner, name of developer, name of insurer and total sum of the contract. You should contact the insurer directly if unsure that the insurance certificate is valid. You should be confident that you would be able to secure financing at the completion of the property. 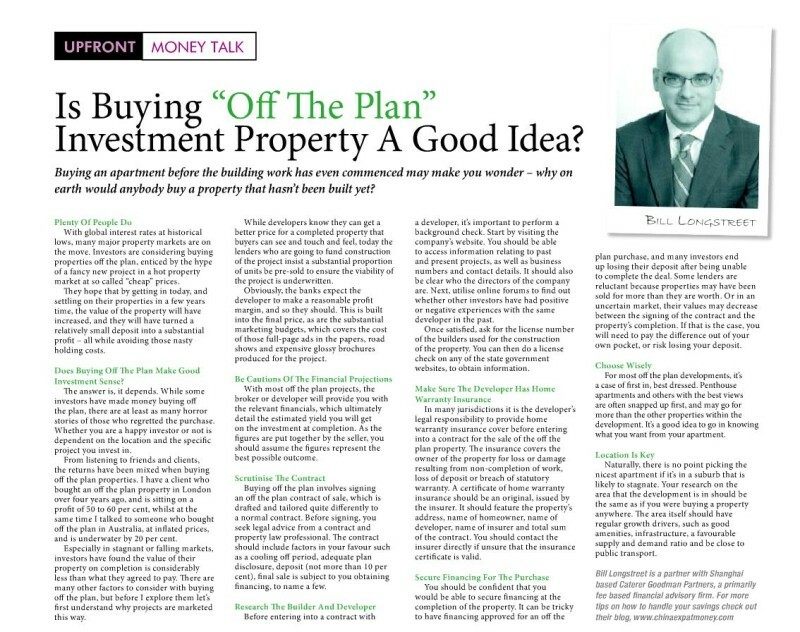 It can be tricky to have financing approved for an off the plan purchase, and many investors end up losing their deposit after being unable to complete the deal. 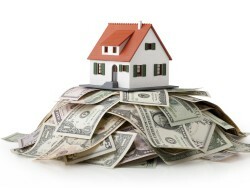 Some lenders are reluctant because properties may have been sold for more than they are worth. Or in an uncertain market, their values may decrease between the signing of the contract and the property’s completion. If that is the case, you will need to pay the difference out of your own pocket, or risk losing your deposit. For most off the plan developments, it’s a case of first in, best dressed. Penthouse apartments and others with the best views are often snapped up first, and may go for more than the other properties within the development. It’s a good idea to go in knowing what you want from your apartment. Naturally, there is no point picking the nicest apartment if it’s in a suburb that is likely to stagnate. Your research on the area that the development is in should be the same as if you were buying a property anywhere. The area itself should have regular growth drivers, such as good amenities, infrastructure, a favourable supply and demand ratio and be close to public transport. Tags: 1 Caterer Goodman Partners, Bill, Bill Longstreet, Caterer Goodman, Caterer Goodman Partners, Caterer Goodman Partners, China, China Expat, China Expat Money, Chinese economy, Financial Advice, Invest Tips, Investing offshore, Investment, Property, Shanghai, Shanghai Expat, world economy.